The history of Ireland has in many ways been a story of war between two countries – Ireland and Britain – which has resulted in segregation and discrimination. Since the earliest days of the British invasion and occupation of Ireland, Irish people have been subjected to discrimination based on their race, language, culture, history, and religion. The native language of Ireland is Gaelic, and the Irish people are believed to be descended from ethnically distinct groups. Traditional Irish religions were pagan, but the country has been overwhelmingly Catholic since 5th-century Roman times. These cultural differences were viewed with disdain by the invading Britons, who spoke a different language, English, were descended from Anglo Saxons, and practiced a Protestant form of Christianity, Anglicanism. As a result, Britons discriminated against the native Irish. An example of this discrimination is the Plantation Period of the 17th and 18th centuries, in which Britain endorsed Scottish and English settlement of lands in Ireland which had been seized from the Irish people. Foreign settlers did not integrate well, and there was deep resentment among the Irish, who had been forced off of their native lands, and become migrants or tenant farmers. Under British law, the foreign settlers were in many cases not even allowed to hire indigenous Irish people to work on the land or in their homes. This was a deliberate strategy by the British to cause segregation, and is a prime example of indirect discrimination; structured discrimination executed by an institution or government.1 Indirect Discrimination also led to numerous revolts and massacres ensued, most notably the Siege of Drogheda, in which the British general, Oliver Cromwell, and his troops brutally massacred thousands of Irish civilians, including the elderly, women, and children. In 1800, the Act of Union politically joined Britain to Ireland, a major blow to Irish independence. Throughout the 19th century, various Irish groups fought to repeal the act and to achieve independence for Ireland. 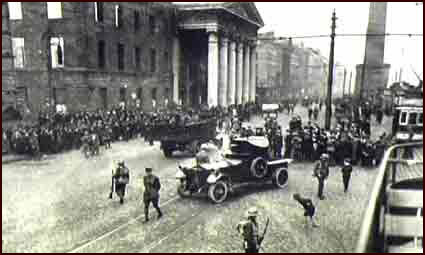 Tensions came to a head in 1916 with the Easter Rising, in which the Irish Republican Brotherhood (IRB) recruited a number of Republican Irish organizations, including Sinn Fein and the Irish Citizen Army (ICA), to rebel against the British occupiers. Hundreds of men gathered in central Dublin, taking control of the General Post Office, and reading a proclamation of the Republic. They succeeded in holding off British troops for a week. Though the Rising was ultimately a failure, it had the effect of drawing international awareness and sympathy for the Irish cause, and of inciting a rush of new recruits to the movement. For the first time, it appeared that the Irish people might actually be able to defeat the British. In a sense, the Easter Rising of 1916 was the beginning of the modern Troubles, because it was the first major modern effort to declare Irish autonomy through both military and political means. To secure the British government in Ireland, the Britons put in place a systematic discrimination process called “gerrymandering,” which created a weighed voting system in favor of the Protestants.6 By rigging the voting boundaries, the Unionists made it impossible for the Catholic community of Northern Ireland to obtain political representation. 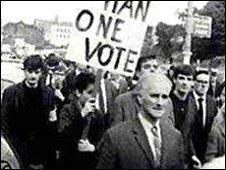 Much revising of this voting system was put in place by Northern Ireland’s first Prime Minister, James Craig, who firmly believed in the maintenance of Unionist power and Ireland’s marriage with Britain. His philosophy was that the safety of the Protestant State was the supreme law. One of the largest examples of gerrymandering was in Derry, where there was a substantial majority of Catholics. The voting wards were designed so that the city council would constantly contain a majority of Unionist councilors, despite the Unionist minority in the city populous. This and similar systems of gerrymandering established a strong bias of Unionist opinion in most city councils throughout Northern Ireland, and thus the councils were able to allocate jobs and housing to the Protestant population while withholding these rights from the Irish. The segregation of Catholics in Northern Ireland, in the areas of land-ownership and voting rights, in effect lead naturally to their discrimination in the job market. Because Protestants possessed most land in Northern Ireland, and thus the businesses built on that land, there was little work for Catholics to find outside of the Unionist sector. Dating back to the 17th and 18th centuries, laws were in place by the British prohibiting Protestant settlers to hire the native Irish, creating large amounts of unemployment among the Catholic community while breeding frustration and violence from the oppression. In 1976 the Fair Employment Act was passed, making it unlawful to discriminate in the area of employment based on religion or political affiliation. The establishment of the Fair Employment Agency (FEA) was put in place, enabling victims of discrimination to report their treatment. Businesses were required to sign a declaration of equality put forth by the FEA. This effort was in an attempt to decrease segregation and discrimination of the Catholic population, while also decreasing the number of unemployed in Northern Ireland. In 1989, the Act was reviewed and the results showed that the unemployment rate of both Catholics and Protestants had not improved. After heavy debate, the Act was reformed under the direction of the Fair Employment Commission (FEC), and was provided with extra resources and power by the government.9 Leading into the late 1990’s, it was found that the gap in unemployment between Catholics and Protestants was still extremely large, but the Act was not reformed again. The use of “Peace Walls” has become extremely popular in assisting to ease tension between Catholic and Protestant communities in Northern Ireland. These walls range from 15-25 feet tall and are constructed of concrete, steel and often barbed wire; however their effectiveness of limiting violence between communities has yet to be proven. One major wall was constructed in West Belfast, and separates the Falls Road community, a heavily Catholic neighborhood, from the Shankill Road Protestant neighborhood. Since the creation of this wall, much controversy has risen as to its symbolism and purpose, especially during a time when a unification of these two communities may be needed. Many see the wall as a barrier, hindering the relationship between the two areas and intensifying the issue of segregation, while others find it necessary in restricting the integration of community members, especially while the threat of violence is still high. During the Troubles, education was also segregated. Protestant schools at the time were of high caliber. Catholic youth were disadvantaged and not given the same educational opportunities as Protestants. Many didn't go onto university. Today, the majority of youth still attend either Protestant or Catholic schools until university. Integrated school attendance is starting to raise, with many communities pushing for further enrollment. Many university students we met had not attended a school with the opposing religion. University is usually the first time a Catholic would meet or talk to a Protestant for example. Even though the two religions are educated separately, the majority of young adults integrate with either religion. There are many psychological effects that can be examined when looking at individuals subject to segregation and discrimination, particularly when looking at members of the Catholic population of Northern Ireland during the history of the Conflict. One can also look at the Unionist community and examine the pressures and psychological operations that lead to the damaging treatment of the Catholics during this period. The establishment of laws put in place by the British government in the centuries leading up to the Troubles, laws prohibiting the employment and housing of Catholics, created frustration and violence between the Catholic and Protestant population. In looking at the psychological causes of this discrimination and as a result the often violent response of the Catholic people, one can see how both the Protestant and Catholic population felt justified in their actions. One major reason why intense stereotyping and negative perspective/ behaviors have ensued among the Catholic and Protestant communities is the effect of Groupthink. Leading to the development of segregation and violence, Groupthink, a psychological effect with which members of the community are influence by the group’s general opinion, can foster irrational decision making that individuals of the community would have otherwise not made if the decision had been their responsibility solely.11 An example of Groupthink can be seen in the violence of Bloody Sunday, with which British combatants, influenced by the hateful, discriminatory rhetoric of the British-controlled Irish government and Loyalist groups, attacked innocent Catholic civilians, brutally murdering women, children and unarmed civil rights marchers. The effects of Groupthink also influenced the participation of many Catholic prisoners during the 1981 Hunger Strikes.